VISION: All children in Florida grow up safe, healthy, educated and prepared to meet their full potential. MISSION: To ensure that the public policy of Florida relating to children and youth promotes interdepartmental collaboration and program implementation in order for services designed for children and youth to be planned, managed and delivered in a holistic and integrated manner to improve the self-sufficiency, safety, economic stability, health and quality of life of all children and youth in Florida. On July 11, 2007, legislation was signed by the Governor that created the Children and Youth Cabinet. The Cabinet is charged with promoting and implementing collaboration, creativity, increased efficiency, information sharing and improved service delivery between and within state agencies and organizations. As directed by statute, in 2007 the Cabinet developed a shared vision and a Strategic Plan to guide the Cabinet in designing and implementing measurable outcomes and actions that promote collaboration and information sharing. The Florida Children and Youth Cabinet held a strategic workshop in Tampa on July 20, 2017 with the purpose of defining three areas of action for the Cabinet members to tackle during the next 18 months. 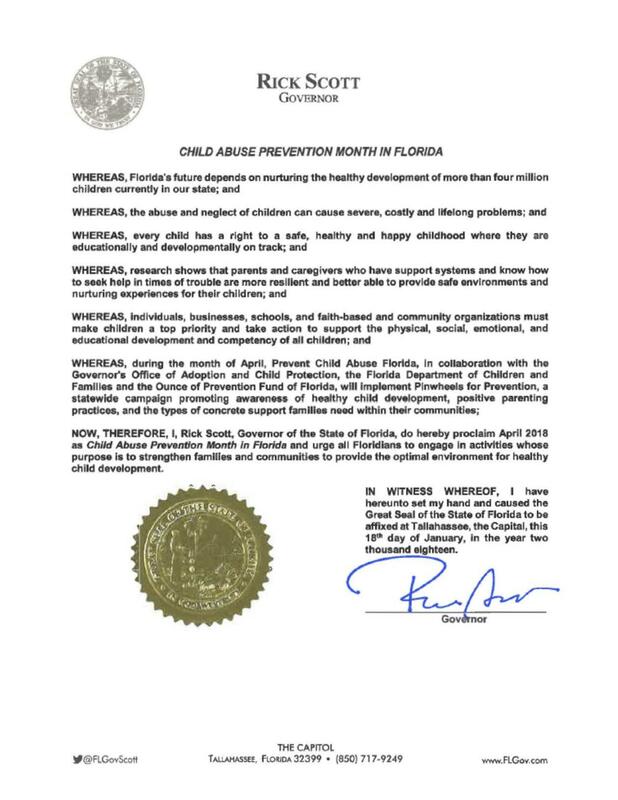 Representative Gayle Harrell presented a resolution to Chair Wansley Walters recognizing April 2017 as Child Abuse Prevention Month in Florida.